I just beat the 1st round, with Zero entered all armor upgrade capsules, and when I'm making progress in New Game Plus save data I found something isn't right; I entered Blizzard Buffalo stage and hold shot button as X, after dismissing the radar map X is locked up and can't move with buster keeps charging. I wonder if my USB controller died, closed Snes9x emulator and opened Castlevania Lecarde Chronicles but the USB controller works fine, then I treat it as minor compatible glitch on Snes9x. But similar case happened another time, that is I entered Blizzard Buffalo stage and hold shot button all the way as Zero, when I reach Buffalo's lair Zero can't move, I released shot button but it still doesn't work, I can't help but wait until Buffalo beats Zero, after restarting at checkpoint Zero still can't move... I checked Snes9x emulator input HUD it shows the shot button is always being held when the (presumably) glitch occurs, I soft reset the game but emulator input HUD is still being hold and Zero still can't move... Close and re-open emulator, re-load save file, the glitch is never encountered again... it's strange. 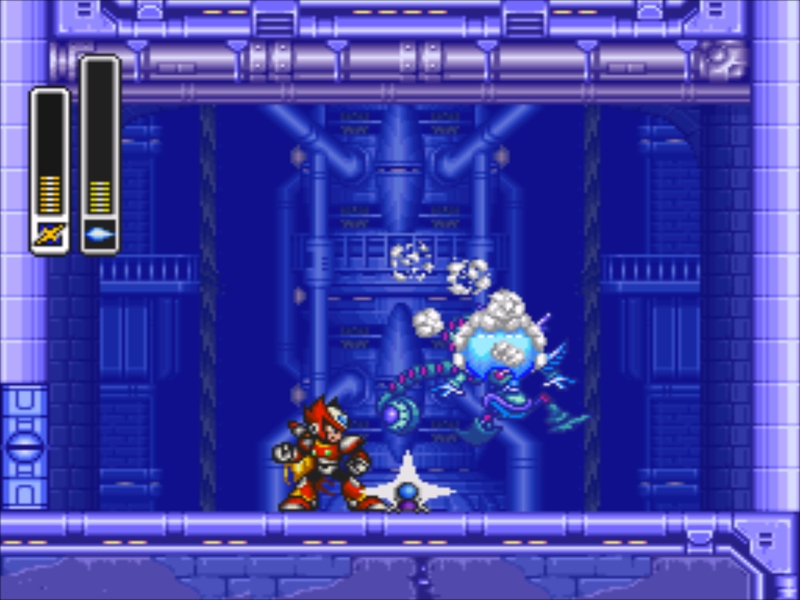 Also I think Zero's defense might be a little too weak against the hand attack of Godkarmachine o Inary, even with black enhancement intact, I didn't remember how the damage was in previous versions but I think the damage here is little too much; but I always have a habit of charging all sub tanks to full after X's Golden Armor enhancement so I can live with that anyway. I was worrying about if splash jump is still intact after reading previous posts but splash jump in this build works fine at least with X. (Edit: Splash jump works with Zero.) No other weird minor glitch occurs besides the one reported so this build is 99% ready to be the definitive version of Zero Project mod. I like Zero's "weapon get" picture since the 4.0 open beta, it's hella cool! There's another glitch within the save data system; after loading the save data with all life upgrades/misc items gathered (requirements are ready to get Hyper Chip/Black Zero) I prepared to go to Doppler stage, and when going through the mid boss section of Doppler stage 1 some of the life upgrade would be lost and I must re-collect all of them. I have no idea how this will happen and how to avoid this glitch. Also I think after loading save state player's damage receiving parameter value has strange behavior which leads to damage of enemies being abnormally high, and render even X's Hyper Chip useless. Yep, I just confirmed this issue FINALLY. It looks like it all has to do with the falling ceiling. It's an extremely rare occurrence that it does this RAM writing, but it DOES do it. I'm not sure why it does it or why it needs to go that far since it seems to roll over back to the original spot after a bit. Worst case scenario, I'll just have to shove the PC stats up another 100 bytes or so. Edit: FIXED! The reason it was happening was due to my 1-up check code so it'd load the proper 1-up icon graphics for X or Zero. I accidentally had it adding the wrong values to check the next chunk of RAM. It was adding +20 instead of +30! Now the bug is fixed! Edit #2: Also.. hopefully fixed an underflow bug with the ammo. I didn't have a proper check for it underflowing so it'd underflow and give the player more ammo and break the sub-weapon life bar. I THINK it works from what I can see so hopefully that knocks those bugs out now. Still a bit new here and sorry if this is normally obvious. How do I implement the bug fixes? Is this done as an entirely new version at ***Mega Man X3 - Zero Project V4.0 (Base Mod)*** on this site? If so, when would this be available? It'll be the next patch release when I get around to it. I've fixed the bugs but I stopped in the middle of implementing a couple of other things and haven't gotten into it since. It'll probably be a bit before I release the next update, unfortunately. I burn out pretty fast when it comes to the X series. Can this be hacked onto the MMX Legacy collection? Yes and no. With some messing around it's definitely possible but there's no possible way to save your game so in the long run it's a no go. I'd love to see you reinsert the prototype Sigma sprites because they look SO much better than the used ones. Maybe even the Godkarmachine Oinary prototype sprites? Thank you for this hack. Tried it out for Christmas Eve with an SD2SNES with the MSU-1 patch applied also and worked like a charm. The only problem I have is that there's no Japanese version of the patch. I liked how the script was cleaned up some what, things like (MEGA MAN) and Capcom localization being lazy altogether. But it would be so much better if it could be done as JP base, or even just basing things off the Japanese script especially for the X dialogue. Because things like X saying "Doc" makes it feel nonsensical and something he would not say and typical English jargan, etc. I just think that would be something awesome for a v5.0 release if it hasn't been talked about already. Especially the early Sigma assets from the first prototype that the post above mentioned. If the purple saber was OP, and there was a way to get it for Zero by killing Vile in the factory, and then fighting the Doppler 2 mini boss as X, I would rate the hack way, way higher. I like the double jump, and I can neon and saber jump as Zero, but the neon doesn't store an extra air dash or double jump, so it's not really that useful. Still cool to neon as Zero, though. I was able to muster a Zero only any% run in 43:10. There's still a lot to optimize in the route, though. Despite the flaws I listed, it's still fun enough for me to keep working on to optimize. And maybe I'll find new glitches to take advantage of. I feel glitches make these games more fun, so there's no real reason to fix them. The Crush Crawfish one wasn't necessarily a glitch fix. The animation itself was ungodly slow and more of an annoyance which is why it was sped up considerably for both X and Zero (Albeit Zero's goes unused right now). But yes, this was made just for casual X3 play. I don't dare do anything to help speedrunning because that's not what my goal ever was and I'd probably break various other things in the long run. Giving Zero the OP Z-Saber was a common request but I decided against it as it just makes Zero into X essentially. I guess in the long run it's no big deal but it's just kind of stupid to have both characters with nearly the exact same upgrades and play style. There's no reason to swap between either of them at that point. My goal was to give X and Zero their own kind of characterization and game play to an extent, more-so than the original and nothing more. Yeah, I can get that. I just personally don't see why I would want to play as X in the hack anyway because if I want to play as X, I'll just play the vanilla, you know? And since the vanilla has the quick kills, and X can do his regular double neon jumps, vanilla game is the more appealing X playthrough anyway. But I guess the optimal way to play this hack, then, is to kill Vile in the factory, kill Zero in Doppler 2, and then play the rest of the game as X. Although I'm more interested in Zero Only runs because I feel like that's the point of the hack. How about just not giving X the saber at all? Make it a Zero exclusive. Or would that be too much of a hassle? Also, is it an intended mechanic that without the buster upgrade, X's Z Saber does little to no damage to bosses? I really prefer using the Z Saber without the buster upgrade due to faster and easier access. But, I mean, like I said: I still enjoy the hack, and appreciate the work that has been put into it. Very professional and well made. The Z-Saber is basically all vanilla when it comes to X. Nothing was really changed on that per se except the actual flat Z-Saber damage (As Zero uses the same damage). Otherwise, yeah, that's just how it was setup in vanilla. I can remove the Z-Saber entirely for X. That's pretty easy at this point since I have full control over the events that take place with Mosquitus. I did intend to give Zero a buster upgrade on NG+ and I had a WIP going for it but never finished it. A lot of WIP things in V4.1 but I just kind of stopped working on everything. (It's pretty buggy right now as is. So many things being worked on at once and I think I broke a lot of various things). I really should also removing the Mosquitus event if you already have the Z-Saber if I haven't already. Seems a little redundant to kill Zero again if you already have the Z-Saber. Some NG+ players would like the option to pursue different plot outcomes, just because they can. Anyhow, I would like the X-Calibur to still be usable. Here's a speedrun strat I came up with for the first Seahorse climb. This hack really lends itself to some swaggy stuff, and I love it. Just wondering if I can get a bit of help. I lost my hard drive with the old Zero Project modded MMX3 rom on it. I'm trying to use Lunar IPS to patch the unheaddered final v4.0 Zero Project onto an unheaddered, unmodded X3.scm rom. I keep getting a bad checksum error on load and the rom fails to start. I played a bit, and I gotta say, I really enjoy this. So many things have been fixed and tinkered with that give X3 a great facelift that it kind of needed. Zero feels great to play as, and some of the quality of life choices are a great addition. But that little bug aside, it's great! It feels very complete for the most part, so hats off to you! 7. The Golden Armor can now be collected in two manners instead of one. a. The first manner is the same as the original game with all upgrades. b. The second manner is based on the Chip Capsules obtained. You can now collect ALL Chip Capsules instead of picking just one. If all four are collected, go to the Golden Armor capsule like normal and you will obtain the Golden Armor! This bypasses the need for full health, all Sub-tanks and all Heart Tanks! c. However, you cannot mix and match these to obtain the Golden Armor. You can go either route, but both routes don't mix to allow obtaining it. Does this mean that I can't get all the upgrades if I were to get all the Chip Capsules if I want the Golden Armor and vice-versa? Yeah, I mentioned it to Justin3009 a while back. I believe he stated that at some point he might make it so that the life bar disappears when bosses are defeated. I think it's due to the blue palette used when the bosses explode.